Perilla (Perilla frutescens var.frutescens) is an annual plant of the Lamiaceae family, mainly grown for obtaining oil by press extraction after roasting the seeds. Oil yield is one of its important traits, but evaluating this yield is time-consuming, requires many seeds, and is hard to adjust to pedigrees in a breeding field. The objective of this study was to develop a method for selecting high-oil-yield lines in a breeding population without oil extraction. Twenty-three perilla cultivars were used for evaluating the oil yield and seed traits such as seed hardness, seed coat thickness, seed coat proportion and crude fat. After evaluation of the seed traits of 23 perilla cultivars, the ranges of oil yields, seed hardness, seed coat thickness, seed coat proportion, 100-seed weight, and crude fat were 24.68-38.75%, 157-1166 gf, 24-399 ㎛, 15.4-41.5%, 2.79-6.69 g, and 33.0-47.8%, respectively. In an analysis of correlation coefficients, the oil yield negatively correlated with seed length, seed width, the proportion of seed coat, seed hardness, and 1000-seed weight, but positively correlated with crude fat content. It was observed that as the seed coat proportion increased, the seed coat thickness, hardness, and 1000-seed weight also increased. Multiple linear regression (MLR) was employed to find major variables affecting the oil yield. Among the variables, traits crude fat content and seed coat proportion were assumed to be indirect parameters for estimating the potential oil yield, with respect to a significant positive correlation with the observed oil yield (R2 = 0.791). Using these two parameters, an equation was derived to predict the oil yield. The results of this study show that various seed traits in 23 perilla cultivars positively or negatively correlated with the oil yield. In particular, crude fat and the seed coat proportion can be used for predicting the oil yield with the newly developed equation, and this approach will improve the efficiency of selecting prominent lines for the oil yield. Perilla frutescens (L.) Britton var. frutescens, an annual plant from the Lamiaceae mint family, is the second-biggest upland crop of South Korea (KOSIS, 2018) which originated in East Asia. Perilla is usually consumed in two ways on Korean dishes, as oil and leafy vegetable. For this reason, the perilla cultivar has been developed for the purpose of either extracting oil or harvesting fresh leaves. Generally, the cultivars used for oil have large amount of crude fat contents in the soft, thick seed and have early-flowering date. On the other hand, the cultivars used for vegetable have heart-like large leaves, relatively late flowering date and contain pigments and volatile compounds like perilla aldehyde, which is expressed as unique color and scent of perilla leaves (Choung, 2005). Perilla seed mainly contains lipid and protein, which is 44.4% and 17.4% of seed grain, respectively. Also, carbohydrate takes about 29.9% of seed and 8.3% for ash (RDA, 2017). Perilla oil is one of the richest ω-3 fatty acid source among the edible seed oils (Asif, 2011). Linolenic acid takes 63.1% of the total fatty acid in perilla oil. Oleic and linoleic acids are composed of 15.2% and 13.9% of fatty acids, and saturated fatty acids like palmitic acid and stearic acid takes 6.5% and 1.7%, respectively (Ryu et al., 1993). Recently, several functional components contained in perilla had been reported to show anti-inflammatory response, and inhibitory for α-glucosidase and antioxidative activity (Banno et al., 2014; Ha et al., 2012; James et al., 2000; Žekonis et al., 2008). Moreover, it is demonstrated that the α- linolenic acid, which is rich in perilla seed, has reduced the risk of cardiovascular diseases and affected the change of brain lipid composition and recognition ability in several studies (Guixiang et al., 2004; Hamazaki et al., 1996; Kim et al., 2010; Lee et al., 2017; Schaefer et al., 2006; Yamamoto et al., 1987; Zhang et al., 2014). Since the nutraceutical potentials of perilla have been reported, consumption of perilla oil has increased consistently. Korea Agro-Fisheries & Food Trade Corporation informed that the perilla oil retail market had increased by 24.2% in 2016 compared to the record from 2012 (FIS, 2017). Researchers of the National Institute of Crop Science have developed perilla cultivars exclusive for oil extraction based on seed components like crude fat and linolenic acid composition (Lee et al., 2011). Generally, seed oil from oil-bearing grains like soybean, maize or canola are obtained by mechanical extraction, solvent extraction, supercritical CO2 or aqueous enzymatic extraction method (Eggers, 1985; Li et al., 2014; Rosenthal et al., 1996). In the case of perilla oil, traditional method is used, usually hydraulically expressed after roasting. In order to have high oil yield, manufacturers roast perilla seed at high temperature over 180℃ and then extract the oil using a pressing machine when the grains exude nutty flavors and expanded by heat. By this process, perilla oil can get its unique flavor and fragrance as seasoning oil (Kim et al., 1996). Like other oil processing, the seed properties of the raw materials would determine the cost and productivity. Aremu and Ogunlade (2016) reported that African oil bean had oil yield variation due to the diameter of seeds when using mechanical oil press. Similarly, seed coat ratio and oil body organelles of rapeseed were highly correlated with oil content (Hu et al., 2013). Considering this, it is assumed that perilla oil yield could also be closely related with morphological characteristics and seed constituents. However, selection of elite lines was conducted based on breeder perception even if oil yield improvement is one of the priorities in perilla breeding. In order to develop a cultivar with high oil yield, it is important to determine seed phenotypic properties connected to oil yield. Therefore, in this study, the parameters which have influence on oil yield were identified by examining the morphological characteristics of perilla seed from the developed cultivars. 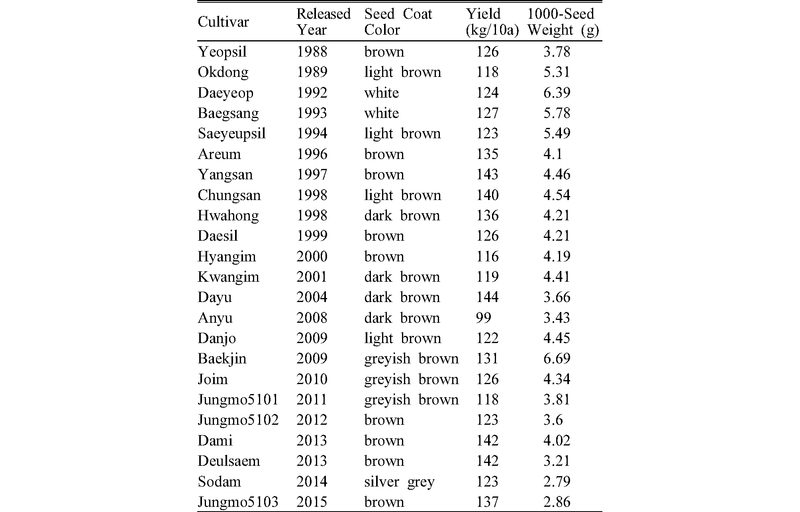 Twenty three perilla cultivars harvested at the National Institute of Crop Science (NICS) in Miryang in 2016 were examined in this study (Table1). All samples originated from Breeder’s seed managed by the NICS breeding team and produced by standard cultivation techniques for perilla. The moisture content of the sample was adjusted to 7% on average. Table 1. Information on the 23 Korean perilla cultivars examined. Oil yield was evaluated by calculating average oil weight extracted from automatic oil press. Prior to extracting, five hundred grams of perilla seed were roasted at 180℃ for ten minutes using automatic stir-roasting cauldron (24" Electric roaster, Dongbang Machinery Co.). Roasted perilla seed was divided into two hundred grams per sample for replication, then inserted into the expeller oil pressing machine (Oillove, NationalENZ). After refining using a filter paper (Qualitative filter paper No.10, Hyundai Micro Co.), oil weight was measured at room temperature. The following seed properties were chosen for this study: seed size, seed coat thickness, seed coat proportion, and seed hardness. Seed size and seed coat thickness were measured by a digital microscope (IMSD345, Sometech Vision) and images were obtained at 160 magnification scale, processed by 1/100 mm objective micrometer and calculating software (IMT iSolution Lite ver.9.1, IMT). Each seed was longitudinally cut into two to make symmetrical split pieces using a razor blade (ST-300, Dorco). Seedcoat thickness was determined at three section points by visual judgement and measured by the software. The thickest part was observed near the hilar area while the thinnest part was measured at the furthermost point from the hilar area, and the medium thickness at the width axe point was chosen. A proportion of seed coat was examined by measuring the weight after carefully removing the cotyledon using tweezers. The hardness of the perilla seed was determined by a texture analyzer, at the point of breaking strength using a cylindrical probe (TA1_FG/CY10, Lloyd Instrument). For the crude fat content, two grams of homogenized perilla seed was put into the cellulose thimble (Z27-103-9, Whatman) and crude fat was extracted by automatic soxhlet analyzer (B-811, Buchi) with n-hexane (Extra pure grade, Daejung Chemical) by the method of Oh et al. (2000). All statistical analysis was performed by SAS ver. 9.4 (SAS Institute Inc, 2012). The morphological characteristics, oil yield and crude fat content of perilla seed varied by cultivar. The average, minimum, maximum and standard deviation of examined seed properties is shown in Table 2. The average oil yield was 31.58%, and ‘Yeopsil’ with the highest yield at 38.75% and ‘Baekjin’ with the lowest at 24.68%. The crude fat content was highest on ‘Yeopsil’ and lowest on ‘Baekjin’ cultivar with an average of 41.1% of seed weight. In the case of seed hardness, ‘Daesil’ was the lowest of 157 gf and ‘Baegsang’ was the highest of 1166 gf in seed breaking point. Table 2. Seed properties of the examined perilla cultivars. The result of Pearson correlation coefficients between the examined seed properties is shown in Table 3. Oil yield showed positive correlation with crude fat contents but showed negative correlations with seed length, width, seed coat thickness, seed coat proportion, seed hardness, and 1000-seed weight. Seed hardness revealed positive correlation with seed length and width, seed coat thickness, seed coat proportion, and 1000-seeds weight, while it showed negative correlation with crude fat contents. The seed coat proportion increased as seed coat thickness, hardness, and 1000-seed weight increased. Table 3. Pearson’s correlation coefficients between variables of the tested perilla seed. The 1000-seed weight showed significant positive correlation with seed length and width, which is an essential trait selection for perilla yield components. However, 1000-seed weight was negatively correlated with oil yield. Like ‘Baekjin’ and ‘Baegsang’, varieties with heavier 1000-seed weight indicated lower oil yield. It was assumed that seed kernel takes a small part of seed weight for cultivars with relatively thicker and heavier portion of seed coat. Also, seed hardness forces of these cultivars were much higher, which was not a favorable trait for oil processing. Regarding the differences in oil yield of perilla varieties, respective parameters for increasing selection efficiency to identify promising line with less time and cost were determined. Multiple linear regression was used to estimate parameters which affect oil extraction. To optimized oil yield estimation, multiple linear regression in two-way was conducted (Table 4). The value of crude fat content and seed coat proportion made significant equation for estimating oil yield at stepwise analysis, while by removing inexplicable variables from the equation backwardly, seed coat thickness, seed length, width, and crude fat contents remained for available parameters. Fig. 1 shows the comparison between expected and actual oil yield, with the coefficient of determination at 0.791 and 0.851, respectively. However, in stepwise regression, coefficient of seed coat proportion is positive, which is opposite to the negative relation with oil yield in Pearson correlation (Table 3). In the range from 20.69% to 25.76% of seed coat proportion, the observations had positive correlation with oil yield, with coefficient of determination of 0.725. Likewise, observations of seed coat proportion between 31.94% and 36.64%, their correlation was positive (R2=0.7312). Therefore, it is assumed that this inconsistency is due to the presence of the partial positive slope in certain rage of observations. In backward regression, four variables were selected from the 0.01 significant level. Among four parameters, crude fat content showed the highest standardized estimate, and took the major portion of the determination of oil yield. Variance inflation factors were 1.262, 1.068, 2.482, and 2.140 in the crude fat content, thinnest seed coat thickness, seed length, and seed width, respectively, despite the fact that there were correlations between these four variables. Table 4. Analysis of two-way Multiple Linear Regression for estimating perilla oil yield. The relation between the processed oil yield and predicted oil yield from 23 perilla cultivars with two repeats; A: An equation of oil yield prediction with two parameters from forwardly selected ones in Multiple linear regression (MLR), B: An equation of oil yield prediction with four parameters from backwardly selected ones in MLR. This study demonstrated that seed properties related to oil yield were varied among cultivars. Even though oil yield potential could be identified by using the seed properties from this study, they could not serve as basis for actual measurement because oil yield could also be affected by mechanical process, roasting temperature and time, or the extracting machines used (Bandara et al., 2016; Kim et al., 1996). However, this study focused on seed characteristics to determine phenotypic parameters for selection, laying the extraction method aside. Furthermore, it is hard to take into consideration all of those variables when selecting an elite line efficiently. Therefore, valid parameters were carefully chosen to minimize laborious examination. It was concluded that crude fat contents and seed coat proportion were indirect parameters to estimate potential oil yield, because their oil yield contribution were significantly higher than other parameters. Crude fat content can be examined by solvent extraction like soxhlet method as well as in a nondestructive way like Near-infrared spectrophotometry, which makes producing the breeding line for next year without damaging the seeds. For measuring seed coat proportion, it is necessary to separate the kernel from the seed coat manually by using tweezers, which is quite a hassle and time-consuming. Therefore, this could also be determined by the insight of the breeder or just by observing the seed hardness force, as it was indicated that it is highly correlated with seed coat proportion. Hardness value could easily be obtained by texture analyzer and can be a substitute for seed coat proportion. In other oil seed studies, it is shown that oil yield is affected by other morphological structures such as oil body and seed coat tissue layers (Hu et al., 2013; Li et al., 2006; Mantese et al., 2006; Tzen et al., 1993), and complicated seed constituent differed by seed maturity or environment (Bin et al., 1988; Jamal et al., 2005; Lee et al., 1999; Min & Kim, 1992). For these reasons, there is a need to observe the anatomical features of perilla grain like oil body distribution of the cell and seed coat layers in future studies. Additionally, perilla germplasm or mutant line with wide-range of morphological diversity should also be examined (Lee et al., 1993; Park et al., 2000). Because the perilla materials used in this study originated from perilla cultivars, seed characteristics per sample were varying, thus the value range might be limited to some degree. Therefore, it is necessary for the further structural study of perilla seed and germplasm pool enlargement with wide range of characteristics for the development of precise perilla oil yield modeling needs to be identified. Also, for perilla breeding, seed weight is one of the important agronomic trait to develop high-yield variety (Oh et al., 1997), however this trait showed significant negative correlation with oil yield based from the results in this study. Considering this, selection of elite lines to have high-yield in the field without depriving oil processing performance, apposite application of breeding tool is required. This study was conducted with the grant of the Agenda Project (Project No. PJ01015904) of Rural Development Administration, Republic of Korea. Aremu, A. K. and C. A. Ogunlade. 2016. Influence of moisture content and seed dimensions on mechanical oil expression from African oil bean (Pentaclethra Macrophylla benth) seed. Journal of Biosystems Engineering, 41(3), 193-200. Bin, Y. H., Z. R. Choe, M. S. Yang, and S. H. Kim. 1988. Effects of date and degrees of defoliation on seed yield and fatty acid composition of perilla (Perilla ocymoids L.). Korean Journal of Crop Science1, 33(2), 182-188. Choung, M. G. 2005. Comparision of major characteristics between seed perilla and vegetable perilla. Korean Journal of Crop Science, 50(S), 171-174. Eggers, R. 1985. High pressure extraction of oil seed. Journal of the American Oil Chemists’ Society, 62(8), 1222-1230. Guixiang, Z., T. D. Etherton, K. R. Martin, S. G. West, P. J. Gillies, and P. M. Kris-Etherton. 2004. Human nutrition and metabolism dietary a-linolenic acid reduces inflammatory and lipid cardiovascular risk factors in hypercholesterolemic men and women. The Journal of Nutrition, 134(11), 2991-2997. Hamazaki, T., S. Sawazaki, M. Itomura, E. Asaoka, Y. Nagao N. Nishimura, and M. Kobayashi. 1996. The effect of docosahexaenoic acid on aggression in young adults. Journal of Clinical Investigation, 97(4), 1129-1133. Jamal, A., I. S. Fazli, S. Ahmad, M. Z. Abdin, and S. J. Yun. 2005. Effect of sulphur and nitrogen application on growth characteristics, seed and oil yields of soybean cultivars. Korean Journal of Crop Science2, 50(5), 340-345. James, M. J., R. A. Gibson, L. G. Cleland. 2000. Dietary polyunsaturated fatty acids and inflammatory mediator production. The American Journal of Clinical Nutrition, 71(S), 343-348. Kim, Y. E., I. H. Kim, S. Y. Jung, S. Y, and J. S. Jo. 1996. Changes in components and sensory attribute of the oil extracted from perilla seed roasted at different roasting conditions. Journal of the Korean Society of Agricultural Chemistry and Biotechnology, 39(2), 118-122. Lee, M. H., C. S. Jung, K. W. Oh, C. B. Park, D. G. Kim, J. K. Choi, S. Y. Nam. 2011. A new perilla cultivar for edible seed “Dayu” with high oil content. Korean Journal of Breeding Science, 43(6), 616-619. Lee, S. W., C. H. Park, C. W. Kang, and S. D. Kim. 1999. Changes in oil, tannin, total sugar contents and yield after flowering in peanut. Korean Journal of Crop Science, 44(2), 159-162. Lee, Y. I., I. C. Shin, and J. S. Kim. 1993. Characteristics of induced mutant lines from gamma irridated perilla. Korean Journal of Breeding Science, 26(1), 13-18. Min, Y. K., and Z. U. Kim. 1992. Changes of lipid during maturation of perilla seed (Perilla frutescens). Journal of the Korean Society of Agricultural Chemistry and Biotechnology, 35(3), 139-145. Oh, K. W., M. G. Choung, S. B. Pae, C. S. Jung, K. B. Joo, Y. C. Kwon, J. T. Kim, and Y. H. Kwack. 2000. Determination of seed lipid and protein contents in perilla and peanut by Near-Infrared Reflectance Spectroscopy. Korean Journal of Crop Science, 45(5), 339-342. Oh, K. W., S. B. Pae, J. T. Kim, J. G. Gwak, Y. H. Gwak, and D. U. Kim. 1997. Genetic analysis of yield related in perilla. Korean Journal of Breeding Science, 29(1), 20-21. Park, C.B., J. K. Bang, B. K. Lee, J. K. Kim, B. H. Lee, 2000. Research activity and achievement in mutation breeding of perilla. Journal of the Korean Society of International Agriculture, 12(1), 108-115. RDA; Rural Development Administration. 2017. Oilseed Crop. Rural Development Administration. Rosenthal, A., D. L. Pyle, and K. Niranjan. 1996. Aqueous and enzymatic processes for edible oil extraction. Enzyme and Microbial Technology, 19, 402-420. Ryu, S. N., J. I. Lee, H. S. Lee, C. B. Park, B. R. Sung, 1993. Varietal difference of oil content and omega fatty acid composition in Korea local perilla. Korean Journal of Crop Science, 38(6), 560-565. SAS Institute. 2012. Cary, NC: SAS Institute Inc.
Schaefer, E. J., V. Bongard, A. S. Beiser, L. F. Stefania, S. J. Robins, R. Au, K. L. Tucker, D. J. Kyle, P. W. F. Wilson, and P.A. Wolf. 2006. Plasma phosphatidylcholine docosahexaenoic acid content and risk of dementia and Alzheimer disease. Archives of Neurology, 63, 1545-1550. Tzen, J. T. C., Y. Cao, P. Laurent, C. Ratnayake, and A. H. C. Huang. 1993. Lipids, proteins, and structure of seed oil bodies from diverse species. Plant Physiology, 101, 267-276. Yamamoto, N., M. Saitoh, A. Moriuchi, and M. Nomura. 1987. Effect of dietary a-linolenate/linoleate balance on brain lipid compositions and learning ability of rats. Journal of Lipid Research, 28, 144-151. Žekonis, G., J. Žekonis, R. Šadzevičienė, G. Šimonienė, and E. Kėvelaitis. 2008. Effect of Perilla frutescens aqueous extract on free radical production by human neutrophil leukocytes. Medicina (Kaunas), 44(9), 699-705. Zhang, T., S. Zhao, W. Li, L. Ma, M. Ding, R. Li, and Y. Liu. 2014. High-fat diet from perilla oil induces insulin resistance despite lower serum lipids and increases hepatic fatty acid oxidation in rats. Lipids in Health and Disease, 13(15), 1-9.